Breakfast is the most important meal of the day; and probably my favourite. So many people I know always say ..ahh I don't have enough time in the mornings to think about breakfast, let alone make it healthy and filling to see me through till lunch. I have given these said people a few of my breakfast recipe's and lets say they where very much a hit, so today I have decided to show you lucky people two of my favourite morning recipes using the very delish Upbeat Protein drinks. I have decided to incorporate these Upbeat high protein dairy drinks in my recipes because they are a lot more filling than using your normal whey protein they are really low in fat and calories (no more than 150cal per bottle)...perfect for breakfast and completely delicious. The first recipe I have for you is.. This recipe of mine has been such a hit; even my mum took the recipe of this from me and started selling it ..yep selling it to friends on a weekly basis. I have been perfecting this for ages before I got it just right, now I am finally happy with it I'm ready to share with the world. Overnight Oats are great for quickness, you literally add all the ingredients to an airtight container and leave it..overnight of course. Overnight I will thicken up then all you have to do the next morning is take it out the fridge, add you preferred toppings and enjoy. Add everything mentioned to your jar/container, mix well and leave in your fridge overnight. Then in the morning add what ever toppings you like..I love to add low fat greek yoghurt, honey sometimes almond butter with a sprinkle of almonds and cashews. This recipe is super filling and with the added superfood Chia / Flaxseeds..it gives you those extra amazing health benefits. Chia seeds are loaded with antioxidants, fiber, protein, omega-3 fatty acids they can even lower the risk of heart problems and type 2 diabetes...its crazy how a little seed can do so much ha. Flax Seed is said to be able to improve blood sugars, lower cholesterol and contain omega-3 fatty acids. I find that I can only eat half of this for breakfast, so I may even snack on the rest throughout the day or have it again the day after. The Next Recipe I have is.. This particular recipe is brilliant if you don't want anything to heavy for breakfast but will still fill you up at the same time. All you do is add all the ingredients to your blender apart from the chia seeds. Blend until smooth, pour into your favourite glass sprinkle on the chia seeds for those added health benefits and you could even add a cute straw /garnish like I did haha, it looks like a breakfast cocktail! Hey presto! drink and enjoy. Adding the Oats or muesli to this makes it a lot more filling and breakfast-y than your typical smoothie, to give you slow energy release throughout the day. I absolutely love these Upbeat Protein drinks the other flavour they do is Mango and Passion fruit they are delicious, I think they are a great way to try out protein if your a beginner with it or you just simply need a protein hit on the go and don't fancy carrying one of those beastly sized protein shakers around; These are the perfect size for your handbag ladies, and also make a great snack. You can buy these from most supermarkets for £1.75, Holland and Barrat have them on offer at the moment for only £1. I would love to know if you have tried any of my recipes, so make sure you Tweet or Instagram me your creations, and while your there show them to Upbeat too via Twitter. Will you be trying any of these recipes? Are you a cereal breakfast skipper? 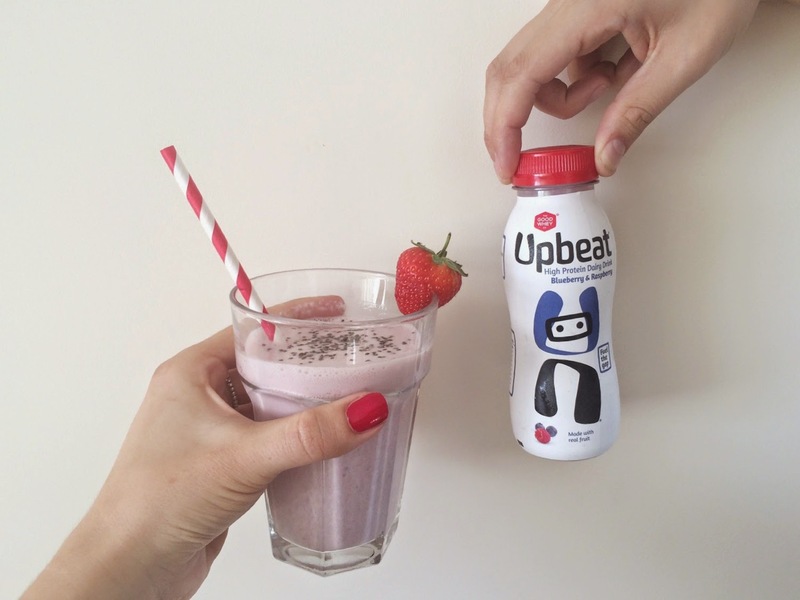 (pun fully intended)..Have you tried Upbeat Protein Drinks? Cant wait to hear your thoughts as always. 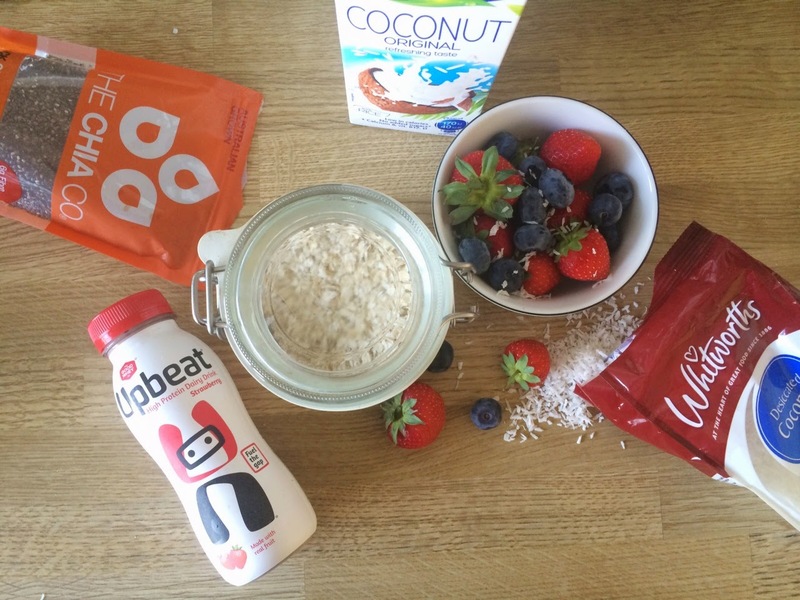 The strawberry and coconut overnight oats look so good! Will have to give them a try. Can't believe your mum started selling them - hope you received some profit haha. I like protein shakes for breakfast, dead quick and they do actually fill you up. 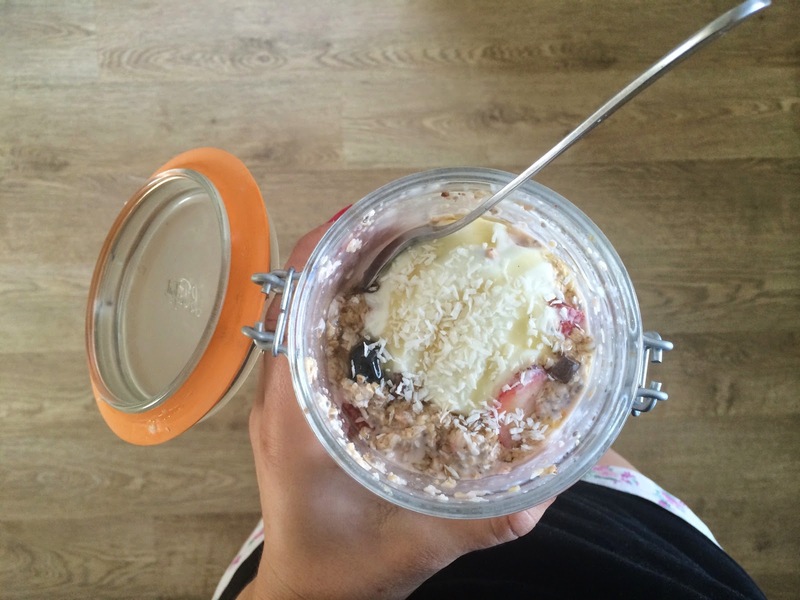 I've been meaning to try overnight oats for ages but always forget!